Four hours exploring the best beer venues in Brisbane. It’s the start of something wonderful. The greatest three-legged race to hit Brewsvegas. A pub crawl of un-beer-lievable proportions. Starting at Newstead Brewing Co. on Doggett Street, the former 1940s bus depot is the first leg in this epic Brewsvegas Three-Legged Crawl through the streets of the Valley. Newstead are hosting a large rotating selection of Victorian craft beers on tap for the week of Brewsvegas as part of Pint of Origin, so there’ll be plenty to choose from alongside other Queensland favourites such as the 3 Quarter Time and Out & A Bout Ales. Heads up (or legs up?) though… make sure you get your ‘crawl challenges’ completed, as once the clock strikes the next hour, you and your partner will tie your legs together and make a short jaunt around the block to another Newstead icon, The Triffid. Situated around the corner on Stratton Street, Triffid is an old commercial hangar that closes the gap between live music and craft beer in an outdoor pop-up beer garden. There will be even more crisp crafties on tap here, where you can grab some race sustenance and start ticking off more ‘crawl challenges’ – selfie with the bartenders anyone? Before too long you and your partner will tie your legs together again in feverish haste to crawl down Ann Street in a race to complete the next leg of the crawl, with sneaky little challenges to complete along the way. The last leg of this crawl… the Osbourne Hotel on the corner of Ann and Constance Street, where what was old, is new again! Boasting 92 beer taps, this is the perfect watering hole to quench that post race thirst and indulge in delicious menu of pub favourites ($10 pizzas at the Os … say no more). 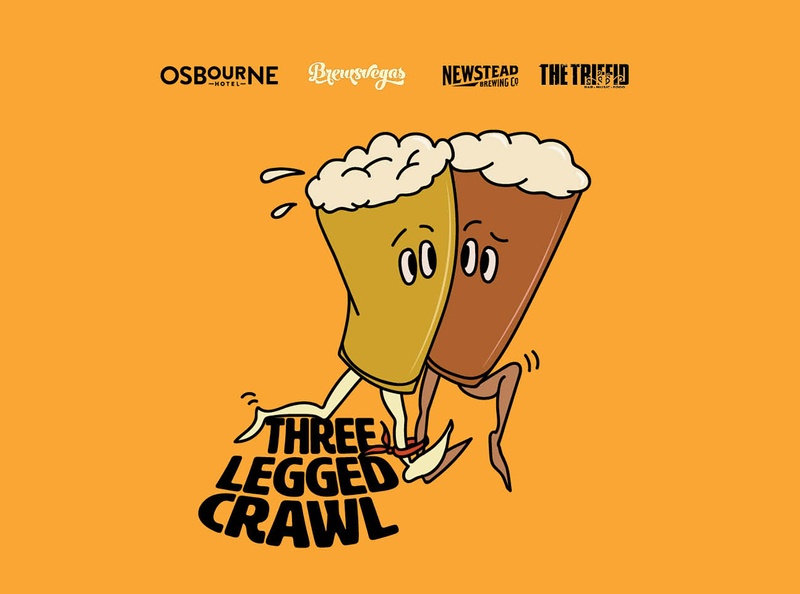 You’ll want to make good time and ensure that all ‘crawl challenges’ have been completed on your scorecard, as the first team to cross the line at the Osbourne Hotel with a completed scorecard checked off by staff will be the champion crawlers and win an impressive prize pack. This epic event between three local favourites is sure to be the talk of Brewsvegas. Make sure at the end of the race you reward yourself and try the official #brewsvegas2019 beer, brewed by the legends at Slipstream Brewing, ready for pouring at the Osbourne Hotel. This is a FREE event, so make sure you register you and your race mate, as limited spots will fill up quick! The crawl kicks off at 11am sharp at Newstead Brewing Co. Be there and be prepared.